While the news attracted little attention, it’s hard to see the incident as inconsequential for Sino-Indian relations, as it suggests potential links between China’s intelligence agencies with insurgent groups in India’s volatile Northeast region. More worrisome for New Delhi, though, is the fact that Qing’s case is only one of several recently that suggest an attempt by Beijing to step up efforts at undermining peace and increasing leverage over India as both countries grapple with sensitive border negotiations. Such dealings were recently revealed in detail in a 100-page Indian government report, accessed by Outlook India. The report pertains to the October 2010 arrest by Indian authorities of Anthony Shimray, a key official and major arms procurer of the NSCN-IM, who had been operating out of Bangkok. During his interrogation, the report alleged that the NSCN-IM was offered the chance to purchase surface-to-air missiles (SAMs) by Chinese agents working on behalf of the Chinese intelligence agencies. The negotiations for the deal reportedly took place in Chengdu in December 2009, with the agents asking $1 million for the missiles as part of a package that included training the rebels in the technical know-how to use them. However, the deal reportedly fell through as the rebel groups couldn’t raise the money. Shimray also admitted that in return for Chinese support, Naga insurgents had been giving away details of Indian army deployments in the China-India border region of Twang in Arunachal Pradesh, including positions of Indian aircraft and missiles. If substantiated, Shimray’s revelations would mark for Indian officials a clear and troubling increase in covert Chinese intelligence activity in India’s internal affairs. 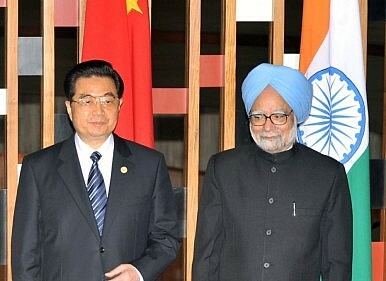 China has maintained that it doesn’t interfere in India’s internal affairs, adhering closely to the Five Principles of Peaceful Coexistence—a series of agreements in 1954 put forward by Chinese Premier Zhou Enlai governing relations with India. But China also remains deeply distrustful of Indian intentions along the sensitive southern tip of the Sino-Indian border, and may perceive India’s complex web of insurgent groups in that area as an opportunity to undermine India’s grip on power there. During his interrogation, Indian intelligence officials were said to have been shocked at the breadth and complexity of apparent ties revealed between Chinese intelligence and NSCN-IM operatives, in many cases utilizing a vast network of front companies and middlemen in Nepal, Bangladesh, Thailand, and North Korea. Shimray revealed that he first visited China in 1994 as part of a joint arms deal with the Indian insurgent group National Democratic Front of Bodoland (NDFB). The procurement of the arms and ammunition was made from the Chinese civil-defence company NORINCO (Beifang Gongye), and included 1,800 pieces of arms, AK series rifles, M16 automatic assault rifles, machine guns, sniper rifles, and rocket launchers. The money is said to have come from a Naga businessman using Calcutta-based operators. In 1996, another purchase of arms and ammunition was reportedly made that involved a shipment from Beijing to the fishing town of Cox’s Bazar in Bangladesh using a North Korean ship as the transport vehicle. After the shipment was unloaded in small boats on the high seas and transferred in trucks in Bangladesh, it eventually made its way to the NSCM-IM headquarters in India. One individual in particular—a middleman in Bangkok named Willy Narue—was thought to be a key interlocutor who brokered many of the subsequent arms sales. With Narue’s help, Shimray had reportedly procured arms from the Chinese in late 2007 after it was decided by NSCN-IM leadership in New Delhi to strengthen the weaponry of the organization. Narue facilitated contact between Shimray and an individual by the name of ‘Yuthuna’ in Bangkok, who was a Chinese representative of ‘TCL’—an authorized subsidiary of the Chinese arms company China Xinshidai. According to its website, Xinshidai ‘deals in import and export of specialized products produced by China’s defence industries and general civilian products. ’The purchase included 600 AK series rifles, 6 Lakh ammunition rounds, 200 sub-machine guns, pistols, rocket launchers, light machine guns,and 200 kilograms of RDX (an explosive compound used in making bombs). Valued at an estimated $1.2 million, the shipment was to be loaded from a port in Beihei, China, and sent through a shipping agent of Bangkok-based Intermarine Shipping with the final destination of Cox’s Bazar, Bangladesh. Correspondence was supposedly facilitated using a single email account whose username and password information was shared among Willy Narue, Naga leadership in New Delhi and Nagaland, and Chinese intelligence operatives. Even as recently as last September—just weeks before he was arrested—Shimray was said to be procuring arms, and reportedly had held further talks with Willy Narue. One such purchase being negotiated was to be delivered to Arunachal Pradesh. He even asked the suppliers if they could deliver in the ‘upper part of Arunachal from the Chinese side.’ Investigators strongly suspect Shimray’s covert October trip to India may have been tied to the arms deals. So why the tight relations between China and the NSCN-IM? One factor is said to be the revelation that China had agreed to host a permanent NSCN-IM representative based out of Kunming, Yunnan Province, in 2008. According to Shimray, Muivah had written a letter to senior Chinese intelligence officials to formally appoint Kholose Swu Sumi, a 60-year-old member of the Sema tribe of Nagaland, as the permanent representative of the NSCN-IM in China, which the Chinese accepted. Kholose is said then to have become the key point man for the NSCN-IM in China, meeting regularly with Chinese officials to keep them apprised of peace talk developments in India and relaying information from NSCN-IM operatives about the Indian army along the Sino-Indian border. Kholose, who was reportedly the owner of a precious stones business, received Shimray and his wife at Kunming airport on a visit and introduced him to several Chinese intelligence officials, including a man by the name of Mr. Chang, the head of intelligence of the region in Dehong Prefecture in Western Yunnan. Shimray also apparently met with Lee Wuen, head of intelligence of Yunnan Province, to relay the message that the NSCN-IM wanted their assistance and cooperation. There are several possible motivations for China supporting the NSCN-IM beyond just arms sales. For one, Nagaland straddles Arunachal Pradesh, an area over which both China and India claim sovereignty. For decades, the two militaries have been involved in a cat-and-mouse game along this sensitive border area, each trying to stake a claim along the Line of Actual Control (LAC). By infiltrating an area of strategic sensitivity for India, China could be aiming to secure a bargaining chip in border negotiation talks. Moreover, China is increasingly wary of India’s rise and larger geostrategic intentions as a peer competitor. Thus, Naga rebels offer China a convenient counterweight to India’s efforts at consolidating power and governance in northeast India, giving Beijing the ability to frustrate and distract New Delhi as it struggles to rein in the various insurgent groups that have proliferated inside its borders. This is of particular importance now as the two countries continue to try to resolve their border dispute. Since the early 1990s, Beijing and New Delhi have been locked in seemingly intractable border negotiations that have become something of a litmus test for whether the two aspiring powers can cooperate. If the claims of arms sales to the NSCN-IM in return for intelligence gathering of Indian troops turn out to be true, New Delhi can justifiably argue that Beijing isn’t conducting border negotiations in good faith. The scope and scale of Chinese ties with the NSCN-IM should give New Delhi pause as it pursues closer relations with Beijing, because they could imply a willingness on the part of Chinese intelligence to covertly undermine peace negotiations between the NSCN-IM and the Indian government while simultaneously acquiring potentially useful information about Indian troop movements along the Sino-Indian border. Until recently, it appears that China was able to surreptitiously sell arms to insurgents, exchange funds through neutral countries and plead plausible deniability when Indian authorities investigated such dealings. Beijing would simply say the weapons were procured from unscrupulous Chinese weapons manufacturers on the black market with links to rebel groups in Pakistan, Burma, or Bangladesh, thereby disavowing any direct knowledge or involvement. Shimray’s revelations, if proven true, would certainly make any such subterfuge far more difficult. Lyle Morris is an independent China analyst. His work has appeared in publications including China Brief, YaleGlobal Online and China Economist.